Using beads for trout fishing is one of the most enjoyable forms of fishing an angler can have in their arsenal of fishing tactics. This last week we were on the Big Quilcene River testing out our Ultra Fresh Orange Roe and Cheese Moe Roe fishing beads on some aggressive sea-run coastal cutthroat trout. It was a feeding frenzy! 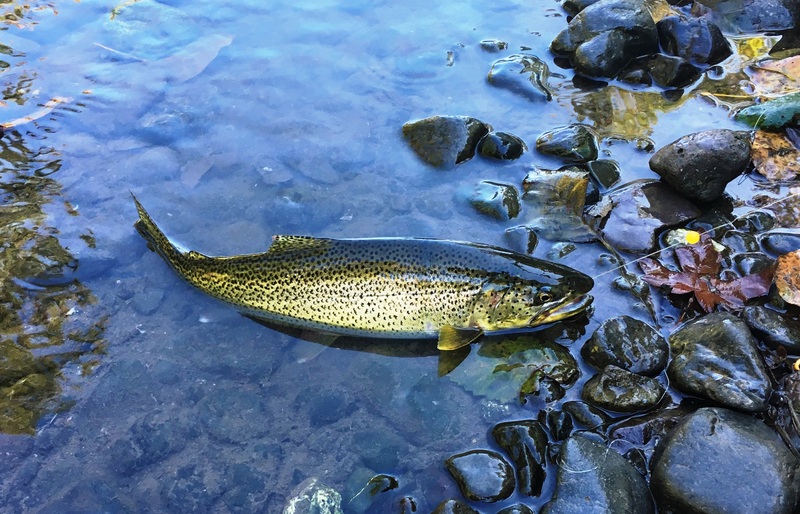 There is simply nothing a hungry trout loves more than salmon eggs. When salmon spawn you’ll find a pile of trout following the school waiting for some fresh salmon eggs to come drifting along. This is where Stone cold Beads really shines. Also using beads for trout fishing is an excellent substitute for natural roe. Especially when you run out of eggs or wish to avoid the mess of using natural bait altogether. For our test run of the sample set of beads we were working with, we decided to run the beads under a float. It’s a simple set up and because of the heaviness of our natural stone beads, no additional weight was necessary! Also, trout have an incredible sense of smell. As an extra attractant, we applied some Pro-Cure Salmon Egg Oil to seal the deal and provide the most natural presentation we could offer. It was pure pleasure to see the aggressive trout attacking our beads! We caught our first trout on a “Cheese Moe Roe” Fishing bead which rewarded us with a beautiful 12 inch. Rainbow trout. Then within minutes, we had a nice little 14 inch. coastal cutthroat on. Next, we switched out to our “Ultra Fresh Orange” Fishing Beads and applied some more salmon egg scent. That’s when things started to really heat up and the Coastal Cutthroat went crazy. In the course of 30 minutes, we caught two more cutthroat and another rainbow trout, all released without harm. It was so fun to watch these trout just attack our beads. It seemed like every trout in the hole was trying to take a crack at them. This test run was truly a great time. There’s nothing better than having a great day fishing on your own gear. We look forward to testing more of our trout fishing beads and providing the results here on our website. Yes! Indeed, fishing beads made from natural stones really do catch fish. Stay tuned for more Stone Cold Beads action, or even better, try our fishing beads for yourself. When you do you’ll see first hand why our eco-friendly fishing beads are the best fishing beads on earth. Hope you enjoy the video below of one of the cutthroat we caught.